Vitaliy Nazarenko is a native of the Ukraine and has over 35 years of fencing experience. He graduated from the Lviv University of Physical Culture and has earned the International Master of Sport in saber fencing. He is also an accomplished foil fencer and coach. While an active saber fencer, Vitaliy won the Ukrainian and USSR national championships multiple times and was a member of a fencing team that won the silver medal in the European Championship. Vitaliy has been a coach for over 20 years, serving as Head Coach in several Greater Boston Area fencing clubs as well as saber coach for the Harvard University fencing team before opening Fencing Academy of Boston in 2012. 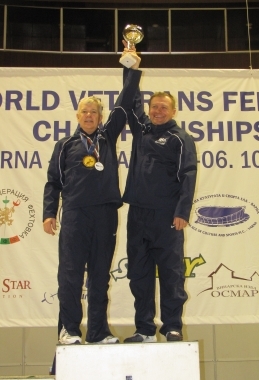 In Vitaliy’s years as a coach, he has led students to win World Championships, USA Fencing National Championships, the Pomme de Terre (New England’s largest fencing tournament), the Bill Hall Veteran’s Challenge (Boston’s only fencing tournament that attracts competitors from across the United States), and North American Cup Tournaments (NACs). When he was the saber coach at Harvard, the Harvard saber team won 9 out of 10 Ivy League tournaments and the Ivy League championship for saber. In October 2013, Vitaliy coached his student to a 1st Place victory at the World Veteran Fencing Championships in the Vet60 Men’s Saber event, in Varna, Bulgaria. Vitaliy Nazarenko (r) with student David Seuss, in October 2013 at the World Veteran Fencing Championships in Varna, Bulgaria. David won 1st Place in the Vet60 Men’s Saber event. Coach Vitaliy is available for 30-minute or 60-minute private saber or foil lessons, tournament coaching, and after-school fencing programs at our site or yours. To arrange private lessons with Vitaliy Nazarenko, please call 617-924-4466 or email fencingacademyofboston@gmail.com.